Our operations and sales teams recently came together for annual strategy and training meetings in Kansas City. While together, I shared ExamOne’s direction for 2019 and a favorite sports moment that I believe illustrates how we and our life insurance clients can achieve success this year. At the 1992 Summer Olympic Games in Barcelona, Spain, the US Men’s 4×100 relay team shattered the previous world record, despite starting the race towards the back of the pack. So how did they start from behind and then win with such a large margin? It required each runner to execute their leg of the race with maximum effort. And when it was time for them to pass the baton ahead, they executed the pass with perfection. Watch for yourself here. I’ve drawn inspiration from this race because it symbolizes how our company has competed and evolved in the past year. Our dedicated employees have contributed maximum effort and now we are gaining momentum,but the race is far from over. How will the race end? I believe that success relies on these 4 things. This may seem like an obvious observation. However, as the life insurance industry shifted over the recent years, it was time for us to recalibrate our client compass as well. Now, our direction is clear. We know that we must be customer-centric first. This clarity drives our innovative solutions like comprehensive and flexible health data insight solutions that our clients need to help them move forward. A gold medal was the ultimate measure of success for the 1992 Olympic team. But how do you define success? Success is measured differently among companies, clients, and individuals. Yet helping protect families with life insurance is a goal we all share. This common objective drives our commitment to provide data products like the recently announced expanded laboratory history to empower clients to make decisions quickly and confidently. Our IT advancements and consumer-friendly screening options are also modernizing the life insurance application process for applicants. The handoff is critical in a relay race and in business. Our teams understand how their roles fit together to form a strong unit ready to carry the baton when it’s their time. 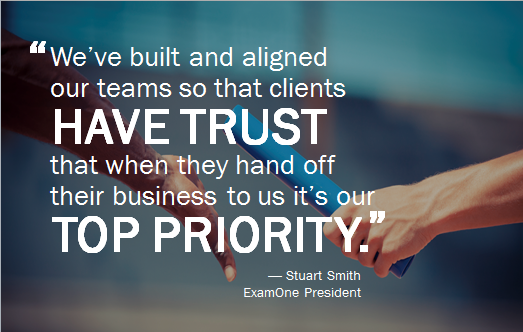 We’ve built and aligned our teams so that clients have trust that when they “hand off” their business to us it’s our top priority. This year we structured our annual meetings into smaller, specific work groups so that the messaging and training was very targeted to help empower each group. Now our teams are better positioned to help you work more effectively. For me, the most powerful image of that Olympic race is the team coming together to celebrate after their victory. I believe it is always important to take time to recognize employees’ accomplishments and praise team efforts. To our clients, I personally want to acknowledge how much we appreciate your partnership. Together, we are all learning how to navigate the current state of the business. One person alone can’t win a relay race; only a team can win. Our team—the combination of dedicated employees and our loyal customers— who will help us and our industry come out ahead.